Felicia and Ashley are both native Texans and are currently Esthetics students at Avenue Five Institute. Their artistic style for this piece was inspired by the free-flowing imagination and originality of the romanticism movement. Felicia is also the proud mother of three-year-old twins. She loves to make people feel good and give back to the community. Ashley and Felicia loved the idea of creating an art bra for such an important cause. Together they spent almost 20 hours crafting this one-of-a-kind art bra. Felicia and Ashley wanted to create an art bra fit for a Mermaid Queen. 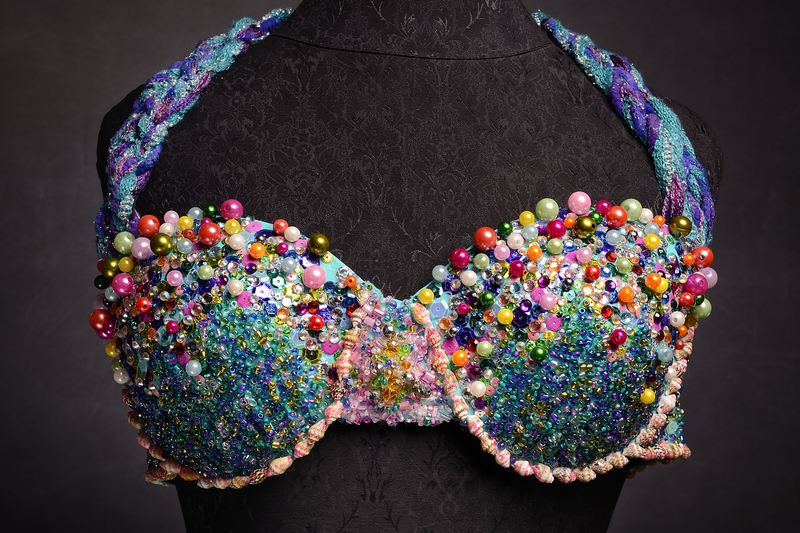 They delicately hand-glued each and every bead, sequin, rhinestones, and crystal onto the bra. They then braided fabric cords of coordinating colors to form each halter strap. The piece was created in honor of Felicia’s mother, Lupe Brown, who was diagnosed with Stage II breast cancer four years ago. After witnessing Lupe’s positivity and grace while going through breast cancer treatment, Felicia looks up to her mother as hero and continues to be inspired by her strength.